The last couple of days have been nice and warm at my house, almost as if summer is making its last-ditch effort on some hot, sun-filled days. I figured we’d take advantage and head outdoors to use that sun for an art activity with an end result we would both love. The sun is hot, and along with offering us warmth and energy, it also has the ability to fade items left outdoors basking it its glow. So using a piece of construction paper as a base for some flowers is a simple way to create a sun print that will remind your child of the long summer days. This project is super easy and can be accomplished by any age level. Just offer some assistant with the second part of the project if working with younger kids. 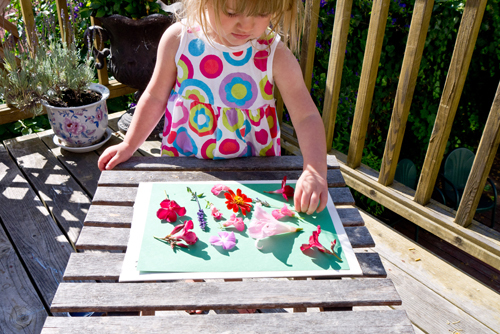 Start by heading outdoors and collecting any summer flowers that your child thinks will leave a nice print. Once she’s got a nice collection, she can place a sheet of construction paper (any color works fine) in a sun-filed spot that isn’t breezy – you don’t want everything to blow away while the sun is doing its job! Now she can think about placement of those flowers. Sure, she can plop them down willy-nilly, but encourage your child to think about how the flowers can be positioned to create an arrangement of shapes that move the eye around the paper. Leave the paper in the sun for at least two hours. Once time is up, your child can carefully lift a flower and check how much the paper has faded. If she’s happy with the results, she can remove, and save, the flowers and then get ready for the next step. Or, if she wants things more faded, let the paper sit for another couple of hours – if you are all that patient! 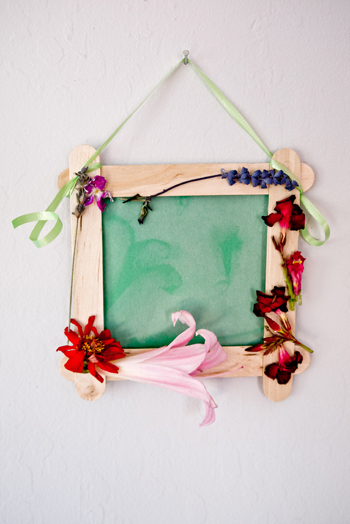 Create a fun frame for the sun print by glueing together four craft sticks into a square and then positioning and then gluing (or hot gun glueing) the flowers around the craft stick frame. Using a hot glue gun is hot, so offer adult supervision as needed with the older kids if wielding hot glue guns. Once the frame is dry, invite your child to cut out her favorite section of the sun print and glue to the frame. Tie a length of ribbon or wire to the top corners of the frame and find the perfect place to display. Everyone will remember what a sunny summer it was when they look at the flower sun print art work!